Charities have failed to understand and react to increasing community expectations placed on them, according to a panel discussion on declining trust in the not-for-profit sector. (From L-R) Anne Skipper, Dr Tessa Boyd-Caine and Paul Ronalds. Paul Ronalds, the CEO of Save the Children Australia, and Health Justice Australia CEO Dr Tessa Boyd-Caine, took part in a panel discussion at The Australian Governance Summit on Thursday. 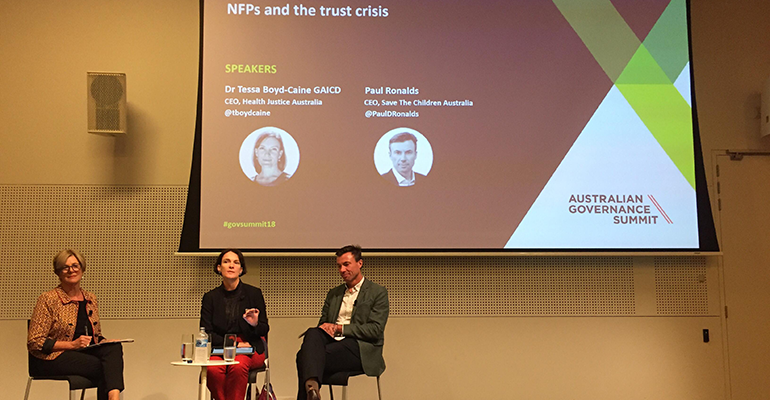 Examining an erosion of trust in the NFP sector in wake of recent charity scandals, Boyd-Caine said findings from the latest Edelman Trust Barometer threw up a number of challenges for the sector. “The Edelman findings showed a decline in institutional trust, but an increase in the trust of individuals, often from the same institutions. So while trust in the media may have declined, trust in journalists has increased,” Boyd-Caine said. “I think that creates a real challenge for us in the not-for-profit sector. Does that mean that investing in your profile through communications and messaging is going to be a better guarantee of securing the support that you want for your work, rather then demonstrating effectiveness? Boyd-Caine said this should lead to “a mature discussion about what it takes to be effective”. “In the US [the discussion is] about the overhead mix and the criticism that charities are spending too much on their organisational capacity,” she said. “This is a sector whose greatest value comes from the workers and the people in it. If we’re not supporting and supervising and developing these workers [to] ensure their effectiveness, then we’re not doing our jobs. Ronalds said the sector was unsustainable in its current state, and needed to focus on increased collaboration and possibly mergers. “Whenever I make comments about sector consolidation, people say ‘you would say that, you’re from a large organisation’, and that’s true, I work for a large organisation but I’ve also worked with small organisations and I sit on the boards of small organisations as well,” Ronalds said. “It’s a much more fundamental issue that I’m concerned about, and that is that the sector as it’s currently constituted is unsustainable. And what that means is that it’s inevitable that we will have high-profile collapses of organisations. Ronalds told Pro Bono News that there were two main factors that had led to the decline of trust in NFPs. “One is actually a broad loss of trust in institutions in society. We’ve seen that with politics, with corporations, media and of course not for profits are being caught up in that,” he said. 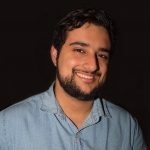 “So it is part of a broad trend, however there is a second issue at play which is much closer to home if you like, and I think it is that many not for profits have failed to understand the increasing stakeholder expectations that are being placed on them and are not reacting fast enough to those changing expectations. He said there were a number of things that NFP directors and leaders could do to address this. “The first thing is making sure that their organisation is investing sufficiently in building that evidence base of impact for their organisation. So that’s the foundation, I think, on which all trust is built for a not for profit. It’s the impact that you’re having on your mission,” Ronalds said. Ronalds added that Australian charities could learn from the scandals afflicting a number of high-profile overseas charities. “I think a range of recent scandals in relation to charities demonstrates that stakeholders have very high expectations because they see charities differently,” he said. “Charities’ values are all about helping the most marginalised and deprived in society. And when even a few employees fail to live up to those standard, it has really significant implications. “We’ve seen that with Oxfam, we’ve seen that with the RSL in NSW and Kids Company in the UK. These are all examples of very high-profile collapses or misconduct of staff, which have not just impacted on that organisation, but also have implications for the whole sector. For Ronalds, it is how charities and NFPs respond to failures and misconduct which is vital to their reputation and the public’s broader trust in the sector. “Trust is important to every organisation. But I think it is an existential issue for charities. It goes right to the heart of the mission of the organisation. So it’s really important for boards of directors and senior management to be really focused on this trust issue,” he said. “They need to look at if they are living up to their values, if their decision making is aligned with their mission and if they are being transparent when the inevitable failures happen.